Preheat oven to 425. Separate pastry shells and place on an ungreased cookie sheet. Bake 18-20 minutes until golden brown and puffed. Cool and then cut each across the center. In a medium saucepan, combine beef broth, cola and onion soup mix. Whisk in potato starch. Cook and stir over medium heat until mixture comes to a boil and thickens. Keep warm over low heat. Heat olive oil over medium-high heat in a 10-inch skillet. Add tenderloin and cook for 4 minutes on each side or until desired doneness is reached.Remove tenderloin and set aside. Add mushrooms and green pepper strips to the same pan. Cook and stir over medium heat for 2 minutes. Remove from heat. Cut tenderloin into 1-inch strips. To serve, place puff pastry bottoms on serving plates. Spoon tenderloin strips, vegetables and gravy over shell bottoms. 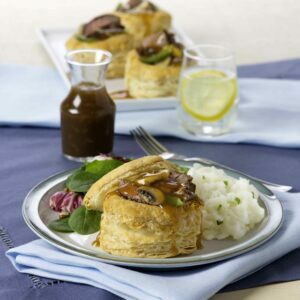 Cover with puff pastry tops and serve immediately.